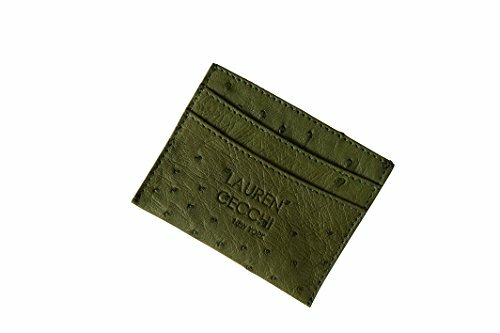 Credit Card Holder - Ostrich Credit Cardholder - Lauren Cecchi New York Ostrich Cardholder for Credit Cards Money and ID-Army Green by Lauren Cecchi New York at Laurenee Lifestyle. Hurry! Limited time offer. Offer valid only while supplies last. Carry all of your credit cards and identification in this elegant Army Green Ostrich Leather Cardholder that echoes your chic and luxurious taste. Carry all of your credit cards and identification in this elegant Army Green Ostrich Leather Cardholder that echoes your chic and luxurious taste. Lauren Cecchi New York Ostrich Leather Cardholders are created using real ostrich leather imported straight from South Africa. Each of the 5 cardholder slots is lined with nylon for ease of use. If you have any questions about this product by Lauren Cecchi New York, contact us by completing and submitting the form below. If you are looking for a specif part number, please include it with your message.